Not to be confused with History of China. The Four Elegant Accomplishments (kin ki sho ga) by Japanese artist Utamaro depicts the traditional Four arts of East Asia. From left to right, the arts depicted include the game of Go, Painting, Calligraphy and the Guqin string instrument. Produced in 1788. The History of East Asia encompasses the histories of China, Japan, Korea, Mongolia and Taiwan from prehistoric times to the present. Some scholars include Vietnam as part of East Asia as it has been considered part of the greater sphere of Chinese influence. The East Asian region is not uniform and each of its countries has a different national history, but scholars maintain that the region is also characterized by a distinct pattern of historical development. This is evident in the interrelationship among East Asian countries, which not only involve the sum total of historical patterns but also a specific set of patterns that has affected all or most of East Asia in successive layers. The study of East Asian history as an area study is a part of the rise of East Asian studies as an academic field in western nations. The teaching and studying of East Asian history began in the West during the late 19th century. In the United States, Asian Americans around the time of the Vietnam War believed that most history courses were Eurocentric and advocated for an Asian-based curriculum. At the present time, East Asian History remains a major field within Asian Studies. Nationalist historians in the region tend to stress the uniqueness of their respective country's tradition, culture, and history because it helps them legitimize their claim over territories and minimize internal disputes. There is also the case of individual authors influenced by different concepts of society and development, which lead to conflicting accounts. These, among other factors, led some scholars to stress the need for broader regional and historical frameworks. There have been issues with defining exact parameters for what East Asian history which as an academic study has focused on East Asia's interactions with other regions of the world. These regions, or the civilizations of China, Japan, and Korea, were under the rule of many dynasties or government systems and their boundaries changed due to inter dynasty wars on a same region or wars between regions. In prehistory, Homo Erectus lived in East and Southeast Asia from 1.8 million to 40,000 years ago. Many belief systems or religions which have evolved and spread in East Asia include Confucianism, Buddhism, and Taoism. China was under the rule of Xia (historicity disputed), Shang and Zhou dynasties followed by the Qin and Han dynasties. During the prehistorical period, these three regions had their own style of inter-regional politics, culture and trades, which were relatively less affected by outside world. Recorded civilization dates to approximately 2000 BC in China's Shang Dynasty along the Yellow River Valley. Civilization expanded to other areas in East Asia gradually. In Korea Gojoseon became the first organized state approximately around 195 BC. Japan emerged as a unitary state with the creation of its first constitution in 604 AD. 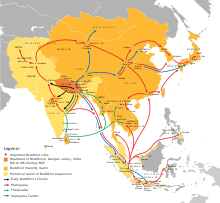 The introduction of Buddhism and the Silk Road were instrumental in building East Asia's culture and economy. The sudden rise of the nomadic Mongol Empire disrupted East Asia, and under the leadership of leaders such as Genghis Khan, Subutai, and Kublai Khan brought the majority of East Asia under rule of a single state. All of China and Korea were annexed under the Mongol Yuan Dynasty. The Mongols also attempted and failed to conquer Japan in maritime invasions. 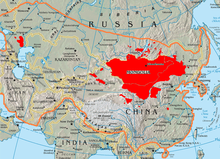 The Mongol era in East Asia was short lived due to natural disasters and poor administrative management. In the aftermath of the Yuan Dynasty's collapse, new regimes such as China's Ming Dynasty and Korea's Joseon embraced Neo-Confucianism as the official state ideology. Japan at this time fell into feudal civil war known as the Sengoku Jidai which persisted for over a century and a half. At the turn of the 16th century European merchants and missionaries traveled to East Asia by sea for the first time. The Portuguese established a colony in Macau, China and attempted to Christianize Japan. In the last years of the Sengoku period, Japan attempted to create a larger empire by invading Korea only being defeated by the combined forces of Korea and China in the late 16th century. From the 17th century onward, East Asian nations such as China, Korea and Japan chose a policy of isolationism in response to European contact. The 17th and 18th centuries saw great economic and cultural growth. Qing China dominated the region but Edo Japan remained completely independent. At this time limited interactions with European merchants and intellectuals led to the rise of Great Britain's East India Company and the beginning of Japan's Dutch Studies. The 1800s however saw the rise of direct European Imperialism upon the region. Qing China was unable to defend itself from various colonial expeditions from Great Britain, France and Russia during the Opium Wars. Japan meanwhile choose the path of westernization under the Meiji Period and attempted to modernize by following the political and economic models of Western Europe and the USA. The rising Japanese Empire forcibly annexed Korea in 1910. After years of civil war and decline, China's last emperor Puyi abdicated in 1912 ending China's imperial history which had persisted for over two millennium from the Qin to Qing. In the mist of the Republic of China's attempts to build a modern state, Japanese expansionism pressed onward in the first half of the twentieth century, culminating in the brutal Second Sino-Japanese War where over twenty million people died during Japan's invasion of China. Japan's wars in Asia became a part of WWII after Japan's attack of the United States' Pearl Harbor. Japan's defeat in Asia by the hand of the allies contributed to the creation of a new world order under American and Soviet influence across the world. Afterwards, East Asia was caught in the cross hairs of the Cold War. The People's Republic of China initially fell under the sphere of the Soviet Camp but Japan under American occupation was solidly tied to Western nations. Japan's recovery became known as the Post-war economic miracle. Soviet and Western competition led to the Korean War, which created two separate states that exist in present times. The end of the Cold War and the rise of globalization have brought South Korea, and the People's Republic of China into the world economy. Since 1980, the economies and living standards of South Korea and China have increased exponentially. In contemporary times, East Asia is a pivotal world region with a major influence on world events. In 2010, East Asia's population made up approximately 24% of the world's population. In China specifically, fossils representing 40 Homo erectus individuals, known as Peking Man, were found near Beijing at Zhoukoudian that date to about 400,000 years ago. The species was believed to have lived for at least several hundred thousand years in China, and possibly until 200,000 years ago in Indonesia. They may have been the first to use fire and cook food. Homo sapiens migrated into inland Asia, likely by following herds of bison and mammoth and arrived in southern Siberia by about 43,000 years ago and some people moved south or east from there. The earliest sites of neolithic culture include Nanzhuangtou culture around 9500 BC to 9000 BC, Pengtoushan culture around 7500 BC to 6100 BC, Peiligang culture around 7000 BC to 5000 BC. China's first villages appeared on the landscape at this time. In Korea the Jeulmun pottery period is sometimes labeled the "Korean Neolithic", but since intensive agriculture and evidence of European-style 'Neolithic' lifestyle is sparse at best, such terminology is misleading. The Jeulmun was a period of hunting, gathering, and small-scale cultivation of plants. Archaeologists sometimes refer to this life-style pattern as 'broad-spectrum hunting-and-gathering'. The Jōmon period occurred in Japan from circa 14,000 BC to 300BC, with some characteristics of both Neolithic and Mesolithic culture. The Xia dynasty of China (from c. 2100 to c. 1600 BC) is the first dynasty to be described in ancient historical records such as Sima Qian's Records of the Grand Historian and Bamboo Annals. Following this was the Shang dynasty, which ruled in the Yellow River valley. The classic account of the Shang comes from texts such as the Book of documents, Bamboo Annals and Records of the Grand Historian. According to the traditional chronology, the Shang ruled from 1766 BC to 1122 BC, but according to the chronology based upon the "current text" of Bamboo Annals, they ruled from 1556 BC to 1046 BC. The Zhou dynasty of c. 1046–256 BC lasted longer than any other dynasty in Chinese history. However, the actual political and military control of China by the dynasty, surnamed Ji (Chinese: 姬), lasted only until 771 BC, a period known as the Western Zhou. This period of Chinese history produced what many consider the zenith of Chinese bronze-ware making. The dynasty also spans the period in which the written script evolved into its modern form with the use of an archaic clerical script that emerged during the late Warring States period. The territories of Mongolia and Inner Mongolia in Ancient times was nomadic, the cultures and languages are modern Mongolian territory were fluid and changed frequently. The use of horses to herd and move started during the Iron Age. North-western Mongolia was Turkic while south-western Mongolia had come under Indo-European (Tocharian and Scythian) influence. In antiquity, the eastern portions of both Inner and Outer Mongolia were inhabited by Mongolic peoples descended from the Donghu people and numerous other tribes These were Tengriist horse-riding pastoralist kingdoms that had close contact with the agrarian Chinese. As a nomadic confederation composed of various clans the Donghu were prosperous in the 4th century BC, forcing surrounding tribes to pay tribute and constantly harassing the Chinese State of Zhao (325 BC, during the early years of the reign of Wuling). To appease the nomads local Chinese rulers often gave important hostages and arranged marriages. In 208 BC Xiongnu emperor Modu Chanyu, in his first major military campaign, defeated the Donghu, who split into the new tribes Xianbei and Wuhuan. The Xiongnu were the largest nomadic enemies of the Han Dynasty fighting wars for over three centuries with the Han Dynasty before dissolving. Afterwards the Xianbei returned to rule the Steppe north of the Great Wall. The titles of Khangan and Khan come from the Xianbei. In 58 BC, the Korean peninsula was divided into three kingdoms, Baekje, Silla and Goguryeo. Although they shared a similar language and culture, these three kingdoms constantly fought with each other for control of the peninsula. Furthermore, Goguryeo had been engaged in constant wars with the Chinese. This included the Goguryeo-Sui Wars, where the Kingdom of Goguryeo managed to repel the invading forces of the Sui Dynasty. As the Kingdom of Silla conquered nearby city-states, they gained access to the Yellow Sea, making direct contact with the Tang Dynasty possible. The Tang Dynasty teamed up with Silla and formed a strategy to invade Goguryeo. Since Goguryeo had been able to repel earlier Chinese invasions from the North, perhaps Gorguryeo would fall if it were attacked by Silla from the south at the same time. However, in order to do this, the Tang-Silla alliance had to eliminate Goguryeo's nominal ally Baekje and secure a base of operations in southern Korea for a second front. 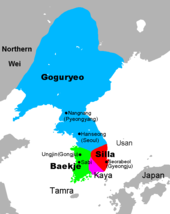 In 660, the coalition troops of Silla and Tang of China attacked Baekje, resulting in the annexation of Baekje by Silla. Together, Silla and Tang effectively eliminated Baekje when they captured the capital of Sabi, as well as Baekje's last king, Uija, and most of the royal family. However, Yamato Japan and Baekje had been long-standing and very close allies. In 663, Baekje revival forces and a Japanese naval fleet convened in southern Baekje to confront the Silla forces in the Battle of Baekgang. The Tang dynasty also sent 7,000 soldiers and 170 ships. After five naval confrontations that took place in August 663 at Baekgang, considered the lower reaches of Tongjin river, the Silla-Tang forces emerged victorious. The Silla-Tang forces turned their attention to Goguryeo. Although Goguryeo had repelled the Sui Dynasty a century earlier, attacks by the Tang Dynasty from the west proved too formidable. The Silla-Tang alliance emerged victorious in the Goguryeo-Tang Wars. Silla thus unified most of the Korean peninsula in 668. The kingdom's reliance on China's Tang Dynasty had its price. Silla had to forcibly resist the imposition of Chinese rule over the entire peninsula. Silla then fought for nearly a decade to expel Chinese forces to finally establish a unified kingdom as far north as modern Pyongyang. Silla'a unification of Korea was short lived. The northern region of the defunct Goguryeo state later reemerged as Balhae, due to the leadership of former Goguryeo General Dae Joyeong. Japan was inhabited more than 30,000 years ago, when land bridges connected Japan to Korea and China to the south and Siberia to the north. With rising sea levels, the 4 major islands took form around 20,000 years ago, and the lands connecting today's Japan to the continental Asia completely disappeared 15,000 ~ 10,000 years ago. Thereafter, some migrations continued by way of the Korean peninsula, which would serve as Japan's main avenue for cultural exchange with the continental Asia until the medieval period. The mythology of ancient Japan is contained within the Kojiki ('Records of Ancient Matters') which describes the creation myth of Japan and its lineage of Emperors to the Sun Goddess Amaterasu. Ancient pottery has been uncovered in Japan, particularly in Kyushu, that points to two major periods: the Jōmon (c. 7,500–250 BC, 縄文時代 Jōmon Jidai ) and the Yayoi (c. 250 BC – 250 AD, 弥生時代 Yayoi Jidai). Jōmon can be translated as 'cord marks' and refers to the pattern on the pottery of the time; this style was more ornate than the later Yayoi type, which has been found at more widespread sites (e.g. around Tokyo) and seems to have been developed for more practical purposes. Confucianism and Taoism originated in the Spring and Autumn period, arising from the historic figures of Confucius and Laozi. They have functioned has both competing and complimentary belief systems. Confucianism emphasizes social order and filial piety while Taoism emphasizes the universal force of the Tao and spiritual well being. Confucianism is an ethical and philosophical system that developed during the Spring and Autumn period. It later developed metaphysical and cosmological elements in the Han Dynasty. Following the official abandonment of Legalism in China after the Qin Dynasty, Confucianism became the official state ideology of the Han. Nonetheless, from the Han period onwards, most Chinese emperors have used a mix of Legalism and Confucianism as their ruling doctrine. The disintegration of the Han in the second century CE opened the way for the soteriological doctrines of Buddhism and Taoism to dominate intellectual life at that time. A Confucian revival began during the Tang dynasty. In the late Tang, Confucianism developed aspects on the model of Buddhism and Taoism that gradually evovled into what is now known as Neo-Confucianism. This reinvigorated form was adopted as the basis of the imperial exams and the core philosophy of the scholar official class in the Song dynasty. The abolition of the examination system in 1905 marked the end of official Confucianism. The New Culture intellectuals of the early twentieth century blamed Confucianism for China's weaknesses. They searched for new doctrines to replace Confucianism, some of these new ideologies include the "Three Principles of the People" with the establishment of the Republic of China, and then Maoism under the People's Republic of China. Taoism as a movement originates from the semi mystical figure of Laozi, who allegedly lived during the 6th–5th century BC. His teachings revolved around personal serenity, balance in the universe and the life source of the Tao. The first organized form of Taoism, the Tianshi (Celestial Masters') school (later known as Zhengyi school), developed from the Five Pecks of Rice movement at the end of the 2nd century CE; the latter had been founded by Zhang Daoling, who claimed that Laozi appeared to him in the year 142. The Tianshi school was officially recognized by ruler Cao Cao in 215, legitimizing Cao Cao's rise to power in return. Laozi received imperial recognition as a divinity in the mid-2nd century BCE. In 221 BC, the state of Qin succeeded in conquering the other six states, creating the first imperial dynasty of China for the first time. Following the death of the emperor Qin Shi Huang, the Qin dynasty collapsed and control was taken over by the Han dynasty in 206 BC. In 220 AD, the Han empire collapsed into the Three Kingdoms. The series of trade routes known as Silk Road began during the Han dynasty. Qin Shi Huang ruled the unified China directly with absolute power. In contrast to the decentralized and feudal rule of earlier dynasties the Qin set up a number of 'commanderries' around the country which answered directly to the emperor. Nationwide the political philosophy of Legalism was used as a means of the statecraft and writings promoting rival ideas such as Confucianism were prohibited or controlled. In his reign China created the first continuous Great Wall with the use of forced labor and Invasions were launched southward to annex Vietnam. Eventually, rebels rose against the Qin's brutal reign and fought civil wars for control of China. Ultimately the Han Dynasty arose and ruled China for over four centuries in what accounted for a long period in prosperity, with a brief interruption by the Xin Dynasty. The Han Dynasty fought constant wars with nomadic Xiongnu for centuries before finally dissolving the tribe. The Han Dynasty played a great role in developing the Silk Road which would transfer wealth and ideas across Eurasia for millennia, and also invented paper. Though the Han enjoyed great military and economic success it was strained by the rise of aristocrats who disobeyed the central government. Public frustration provoked the Yellow Turban Rebellion – though a failure it nonetheless accelerated the empire's downfall. After 208 AD the Han Dynasty broke up into rival kingdoms. China would remain divided until 581 under the Sui Dynasty, during the era of division Buddhism would be introduced to China for the first time. 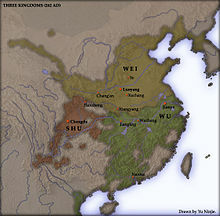 The Three Kingdoms Period consisted of the kingdom of Wei, Shu, and Wu. It began when the ruler of Wei, Cao Cao, was defeated by Liu Bei and Sun Quan at the Battle of Red Cliffs. After Cao Cao's death in AD 220, his son Cao Pi became emperor of Wei. Liu Bei and Sun Quan declared themselves emperor of Shu and Wu respectively. Many famous personages in Chinese history were born during this period, including Hua Tuo and the great military strategist Zhuge Liang. Buddhism, which was introduced during the Han Dynasty, also became popular in this period. Two years after Wei conquered Shu in AD 263, Sima Yan, Wei's Imperial Chancellor, overthrew Wei and started the Western Jin Dynasty. The conquest of Wu by the Western Jin Dynasty ended the Three Kingdoms period, and China was unified again. However, the Western Jin did not last long. Following the death of Sima Yan, the War of the Eight Princes began. This war weakened the Jin Dynasty, and it soon fell to the kingdom of Han Zhao. This ushered in the Sixteen Kingdoms. The Northern Wei was established by the Tuoba clan of the Xianbei people in AD 386, when they united the northern part of China. During the Northern Wei, Buddhism flourished, and became an important tool for the emperors of the Northern Wei, since they were believed to be living incarnations of Buddha. Soon, the Northern Wei was divided into the Eastern Wei and Western Wei. These were followed by the Northern Zhou and Northern Qi. In the south, the dynasties were much less stable than the Northern Dynasties. The four dynasties were weakened by conflicts between the ruling families. Buddhism, also one of the major religions in East Asia, was introduced into China during the Han dynasty from Nepal in the 1st century BC. Buddhism was originally introduced to Korea from China in 372, and eventually arrived in Japan around the turn of the 6th century. For a long time Buddhism remained a foreign religion with a few believers in China. During the Tang dynasty, a fair amount of translations from Sanskrit into Chinese were done by Chinese priests, and Buddhism became one of the major religions of the Chinese along with the other two indigenous religions. In Korea, Buddhism was not seen to conflict with the rites of nature worship; it was allowed to blend in with Shamanism. Thus, the mountains that were believed to be the residence of spirits in pre-Buddhist times became the sites of Buddhist temples. Though Buddhism initially enjoyed wide acceptance, even being supported as the state ideology during the Goguryeo, Silla, Baekje, Balhae, and Goryeo periods, Buddhism in Korea suffered extreme repression during the Joseon Dynasty. In Japan, Buddhism and Shinto were combined using the theological theory "Ryōbushintō", which says Shinto deities are avatars of various Buddhist entities, including Buddhas and Bodhisattvas (Shinbutsu-shūgō). This became the mainstream notion of Japanese religion. In fact until the Meiji government declared their separation in the mid-19th century, many Japanese people believed that Buddhism and Shinto were one religion. In Mongolia, Buddhism flourished two times; first in the Mongol Empire (13th–14th centuries), and finally in the Manchu Qing Dynasty (16th–19th centuries) from Tibet in the last 2000 years. It was mixed in with Tengeriism and Shamanism. In AD 581, Yang Jian overthrew the Northern Zhou, and established the Sui Dynasty. Later, Yang Jian, who became Sui Wendi, conquered the Chen Dynasty, and united China. However, this dynasty was short-lived. Sui Wendi's successor, Sui Yangdi, expanded the Grand Canal, and launched four disastrous wars against the Goguryeo. These projects depleted the resources and the workforce of the Sui. In AD 618, Sui Yangdi was murdered. Li Yuan, the former governor of Taiyuan, declared himself the emperor, and founded the Tang Dynasty. A government system supported by a large class of Confucian literati selected through civil service examinations was perfected under Tang rule. This competitive procedure was designed to draw the best talents into government. But perhaps an even greater consideration for the Tang rulers, aware that imperial dependence on powerful aristocratic families and warlords would have destabilizing consequences, was to create a body of career officials having no autonomous territorial or functional power base. As it turned out, these scholar-officials acquired status in their local communities, family ties, and shared values that connected them to the imperial court. From Tang times until the closing days of the Qing Dynasty in 1911, scholar officials often functioned often as between the grassroots level and the government. This model of government had an influence on Japan, Korea and Vietnam. In the early 13th century Genghis Khan united warring Mongolian tribes into the united Mongol Empire in 1206. The Mongols would proceed to conquer the majority of modern East Asia. Meanwhile, the Chinese were divided into five competing states. From 1211, Mongolia's forces invaded North China. In 1227 the Mongolian Empire destroyed Xixia and its Tangut people entirely. In 1234 Mongolian Ogedei Khan extinguished the Jin Chao. The northern part of China was annexed by Mongolia. In 1231, Mongolia began to invade Korea, and quickly captured all the territory of the Kingdom of Korea outside the southernmost tip. The Goryeo royal family retreated to the sea outside the city of Seoul to Ganghwa Island. The Goryeo Kingdom was divided between collaborators and resisters to the invaders. However, at the time, the Goryeo Sannotei on the peninsula resisted until 1275. In the 1250s the Mongols invaded the last remaining Chinese state – the Southern Song. The invasion carried on for over thirty years, and likely resulted in millions of casualties. The last remnants of the Song were defeated at sea in 1279. China was unified under foreign (Mongol rule). At this time the modern city Beijing was technically the capital of the vast Mongol Empire which stretched as far west as Poland and Syria. However, due to the vast size of the Mongol Empire, and civil war within the Mongol Empire the direct control Beijing had over western areas was weak. In 1271, the dynasty was named the Yuan. The Mongolian administration of Kublai Khan completely shifted to the Central Plains area and embraced Confucianism. By 1275, Goryeo had surrendered to the Yuan Dynasty as a vassal. Members of the Korean Royal family were raised to understand Mongolian Culture, and intermarried with Kublai Khan's family. Japan was seriously threatened by the Mongolian forces from the East Asian mainland. In 1274, Kublai Khan appointed Yudu. In order to recruit Marshal Dongdu to command the Mongolian soldiers, Han Bing and the Korean Army began the first expedition to Japan. The Mongols invaded Japan in two separate invasions, both of which were disrupted by natural typhoons. These two invasions both occupied the town of Kitakyushu before being swept into the sea. At the time the Yuan Dynasty fleet was the largest fleet in the history of the world. In order to cope with the nationwide mobilization of the powerful Mongolian army, Japan's economy and military were placed under severe pressure. The Japanese Kamakura Shogunate had difficulty compensating its soldiers who had defended the country, which intensified the contradiction between the domestic warrior groups. The ruling system collapsed in the first half of the 14th century. A Mongol bomb thrown against a charging Japanese samurai during the Mongol invasions of Japan, 1281. Most sources credit the discovery of gunpowder to Chinese alchemists in the 9th century searching for an elixir of immortality. The discovery of gunpowder was probably the product of centuries of alchemical experimentation. Saltpetre was known to the Chinese by the mid-1st century AD and there is strong evidence of the use of saltpetre and sulfur in various largely medicine combinations. A Chinese alchemical text from 492 noted that saltpeter gave off a purple flame when ignited, providing for the first time a practical and reliable means of distinguishing it from other inorganic salts, making it possible to evaluate and compare purification techniques. By most accounts, the earliest Arabic and Latin descriptions of the purification of saltpeter do not appear until the 13th century. Jiaozi (currency), 11th century paper-printed money from the Song Dynasty. The earliest surviving recipes for gunpowder can be found in the Chinese military treatise Wujing zongyao of 1044 AD, which contains three: two for use in incendiary bombs to be thrown by siege engines and one intended as fuel for poison smoke bombs. The formulas in the Wujing zongyao range from 27 to 50 percent nitrate. Experimenting with different levels of saltpetre content eventually produced bombs, grenades, and land mines, in addition to giving fire arrows a new lease on life. By the end of the 12th century, there were cast iron grenades filled with gunpowder formulations capable of bursting through their metal containers. The 14th century Huolongjing contains gunpowder recipes with nitrate levels ranging from 12 to 91 percent, six of which approach the theoretical composition for maximal explosive force. In China, the 13th century saw the beginnings of rocketry and the manufacture of the oldest gun still in existence, a descendant of the earlier fire-lance, a gunpowder-fueled flamethrower that could shoot shrapnel along with fire. The Huolongjing text of the 14th century also describes hollow, gunpowder-packed exploding cannonballs. In the 13th century contemporary documentation shows gunpowder beginning to spread from China by the Mongols to the rest of the world, starting with Europe and the Islamic world. The Arabs acquired knowledge of saltpetre – which they called "Chinese snow" (Arabic: ثلج الصين‎ thalj al-ṣīn) – around 1240 and, soon afterward, of gunpowder; they also learned of fireworks ("Chinese flowers") and rockets ("Chinese arrows"). Persians called saltpeter "Chinese salt" or "salt from Chinese salt marshes" (namak shūra chīnī Persian: نمک شوره چيني‎). Historian Ahmad Y. al-Hassan argues – contra the general notion – that the Chinese technology passed through Arabic alchemy and chemistry before the 13th century. Gunpowder arrived in India by the mid-14th century, but could have been introduced by the Mongols perhaps as early as the mid-13th century. The first known movable type system was invented in China around 1040 AD by Pi Sheng (990–1051) (spelled Bi Sheng in the Pinyin system). Pi Sheng's type was made of baked clay, as described by the Chinese scholar Shen Kuo (1031–1095). The world's first metal-based movable type printing press was invented in Korea in 1234, 210 years before Johannes Gutenberg invented a similar press in Germany. Jikji is the world's oldest extant movable metal print book. It was published in Heungdeok Temple in 1377, 78 years prior to Gutenberg's "42-Line Bible" printed during the years 1452–1455. In 1603, the Tokugawa shogunate (military dictatorship) ushered in a long period of isolation from foreign influence in order to secure its power. For 250 years this policy enabled Japan to enjoy stability and a flowering of its indigenous culture. Early modern Japanese society had an elaborate social structure, in which everyone knew their place and level of prestige. At the top were the emperor and the court nobility, invincible in prestige but weak in power. Next came the "bushi" of shōgun, daimyō and layers of feudal lords whose rank was indicated by their closeness to the Tokugawa. They had power. The "daimyō" comprised about 250 local lords of local "han" with annual outputs of 50,000 or more bushels of rice. The upper strata was much given to elaborate and expensive rituals, including elegant architecture, landscaped gardens, nō drama, patronage of the arts, and the tea ceremony. Three distinct cultural traditions operated during the Tokugawa era, having little to do with each other. In the villages the peasants had their own rituals and localistic traditions. In the high society of the imperial court, daimyō and samurai, Chinese cultural influence was paramount, especially in the areas of ethics and political ideals. Neo-Confucianism became the approved philosophy, and was taught in official schools; Confucian norms regarding personal duty and family honor became deeply implanted in elite thought. Equally pervasive was the Chinese influence in painting, decorative arts and history, economics, and natural science. One exception came in religion, where there was a revival of Shinto, which had originated in Japan. Motoori Norinaga (1730–1801) freed Shinto from centuries of Buddhist accretions and gave a new emphasis to the myth of imperial divine descent, which later became a political tool for imperialist conquest until it was destroyed in 1945. The third cultural level was the popular art of the low-status artisans, merchants and entertainers, especially in Edo and other cities. It revolved around "ukiyo", the floating world of the city pleasure quarters and theaters that was officially off-limits to samurai. Its actors and courtesans were favorite subjects of the woodblock color prints that reached high levels of technical and artistic achievement in the 18th century. They also appeared in the novels and short stories of popular prose writers of the age like Ihara Saikaku (1642–1693). The theater itself, both in the puppet drama and the newer kabuki, as written by the greatest dramatist, Chikamatsu Monzaemon (1653–1724), relied on the clash between duty and inclination in the context of revenge and love. Edo (Tokyo) had been a small settlement for 400 years but began to grow rapidly after 1603 when Shōgun Ieyasu built a fortified city as the administrative center of the new Tokugawa Shogunate. Edo resembled the capital cities of Europe with military, political, and economic functions. The Tokugawa political system rested on both feudal and bureaucratic controls, so that Edo lacked a unitary administration. The typical urban social order was composed of samurai, unskilled workers and servants, artisans, and businessmen. The artisans and businessmen were organized in officially sanctioned guilds; their numbers grew rapidly as Tokyo grew and became a national trading center. Businessmen were excluded from government office, and in response they created their own subculture of entertainment, making Edo a cultural as well as a political and economic center. With the Meiji Restoration, Tokyo's political, economic, and cultural functions simply continued as the new capital of imperial Japan. Following the Treaty of Kanagawa with the United States of America in 1854, Japan opened its ports and began to intensively modernise and industrialise. The Meiji Restoration of 1868 ended the Tokugawa period, and put Japan on a course of centralized modern government in the name of the Emperor. During late nineteenth and early twentieth century, Japan became a regional power that was able to defeat the militaries of both China and Russia. It occupied Korea, Formosa (Taiwan), and southern Sakhalin Island. In 1931 Japan occupied Manchuria ("Dongbei") after the Manchurian Incident, and in 1937 it launched a full-scale invasion of China. The U.S. undertook large scale military and economic aid to China and demanded Japanese withdrawal. Instead of withdrawing, Japan invaded French Indochina in 1940–41. In response, the U.S., Britain and the Netherlands cut off oil imports in 1941, which accounted for over 90% of Japan's oil supply. Negotiations with the US led nowhere. Japan attacked U.S. forces at the Battle of Pearl Harbor in December 1941, triggering America's entry into World War II. Japan rapidly expanded at sea and land, capturing Singapore and the Philippines in early 1942, and threatening India and Australia. Although it was to be a long and bloody war, Japan began to lose the initiative in 1942. At the Battle of the Coral Sea, a Japanese offensive was turned back, for the first time, at sea. The June Battle of Midway cost Japan four of its six large aircraft carriers and destroyed its capability for future major offensives. In the Guadalcanal Campaign, the U.S. took back ground from Japan. After its defeat in World War II, Japan was occupied by the U.S. until 1951, and recovered from the effects of the war to become an economic power, staunch American ally and a liberal democracy. While Emperor Hirohito was allowed to retain his throne as a symbol of national unity, actual power rests in networks of powerful politicians, bureaucrats, and business executives. The Japanese growth in the postwar period was often called a "miracle". It was led by manufacturing; starting with textiles and clothing and moving to high-technology, especially automobiles, electronics and computers. The economy experienced a major slowdown starting in the 1990s following three decades of unprecedented growth, but Japan still remains a major global economic power. Historically, cultures and countries strongly influenced by Confucianism include mainland China, Hong Kong, Macau, Japan, and Taiwan, as well as various territories settled predominantly by Chinese people, such as Singapore. In the 20th century, Confucianism's influence was greatly reduced. This decline took place in part due to Rise of Communism in much of East Asia, the Chinese Cultural Revolution persecuted traditional Chinese Religions with great intensity. In Japan, the presence of a liberal order and consumerism led to a voluntarily decline of religious belief. Around the turn of the 21st centuries there were talks of a "Confucian Revival" in the academia and the scholarly community. Across the region cultural institutions of religions have remained, even while actual belief has declined. Administrative map of the Mongol ruled Yuan Dynasty in control of modern China and Korea. Voyages of the famous explorer Zheng He and the political situation of his time. Maximum extent of Qing Empire's territory at 1820. Modern day division of Korea, between North and South. ^ "East Asian History | History | The University of Chicago". history.uchicago.edu. Retrieved 2018-08-15. ^ "East Asian History". Department of History. 2015-09-09. Retrieved 2018-08-15. ^ "About Us". as.nyu.edu. Retrieved 2018-08-15. ^ Gilbet Rozman (2004), Northeast asia's stunted regionalism: bilateral distrust in the shadow of globalization. Cambridge University Press, pp. 3-4. ^ Prescott, Anne (2015). East Asia in the World: An Introduction. Routledge. ISBN 978-0765643223. ^ Miller, David Y. (2007). Modern East Asia: An Introductory History. Routledge. p. xi. ISBN 978-0765618221. ^ a b Austin, Gareth (2017). Economic Development and Environmental History in the Anthropocene: Perspectives on Asia and Africa. London: Bloomsbury Publishing. p. 272. ISBN 978-1-4742-6749-6. ^ Walker, Hugh (2012). East Asia: A New History. Bloomington, IN: AuthorHouse. p. 47. ISBN 978-1-4772-6516-1. ^ "A Brief History of East Asian Studies at Yale University | The Council on East Asian Studies at Yale University". ceas.yale.edu. Retrieved 2018-08-15. ^ a b Morris-Suzuki, Tessa; Low, Morris; Petrov, Leonid; Tsu, Timothy (2013). East Asia Beyond the History Wars: Confronting the Ghosts of Violence. Oxon: Routledge. p. 44. ISBN 978-0-415-63745-9. ^ Park, Hye Jeong (2014). "East Asian Odyssey towards One Region: The Problem of East Asia as a Historiographical Category". History Compass. 12 (12): 889–900. doi:10.1111/hic3.12209. ISSN 1478-0542. ^ a b Peking Man Archived 2014-04-19 at the Wayback Machine. The History of Human Evolution. American Museum of Natural History. April 23, 2014. ^ "Population of Eastern Asia". www.worldometers.info. Worldometers. 2018. Retrieved 2018-08-16. ^ Homo erectus. London: Natural History Museum. Retrieved April 23, 2014. ^ By Land and Sea. Archived 2014-04-19 at the Wayback Machine American Museum of Natural History. Retrieved April 23, 2014. ^ Steppes into Asia. Archived 2014-04-19 at the Wayback Machine American Museum of Natural History. Retrieved April 23, 2014. ^ Yang, X.; Wan, Z.; Perry, L.; Lu, H.; Wang, Q.; Zhao, C.; Li, J.; Xie, F.; Yu, J.; Cui, T.; Wang, T.; Li, M.; Ge, Q. (2012). "Early millet use in northern China". Proceedings of the National Academy of Sciences. 109 (10): 3726–3730. Bibcode:2012PNAS..109.3726Y. doi:10.1073/pnas.1115430109. PMC 3309722. PMID 22355109. ^ "Public Summary Request Of The People's Republic Of China To The Government Of The United States Of America Under Article 9 Of The 1970 Unesco Convention". Bureau of Educational and Cultural Affairs, U.S. State Department. Archived from the original on 15 December 2007. Retrieved 12 January 2008. ^ "The Ancient Dynasties". University of Maryland. Retrieved 12 January 2008. ^ Craig 1998, p. 550. ^ Bhattacharya (in Buchanan 2006, p. 42) acknowledges that "most sources credit the Chinese with the discovery of gunpowder" though he himself disagrees. ^ Buchanan. "Editor's Introduction: Setting the Context", in Buchanan 2006. ^ Needham, Volume 5, Part 7, 264. ^ Oliver Frederick Gillilan Hogg (1970). Artillery: its origin, heyday, and decline. Archon Books. p. 123. The Chinese were certainly acquainted with saltpetre, the essential ingredient of gunpowder. They called it Chinese Snow and employed it early in the Christian era in the manufacture of fireworks and rockets. ^ Oliver Frederick Gillilan Hogg (1963). English artillery, 1326–1716: being the history of artillery in this country prior to the formation of the Royal Regiment of Artillery. Royal Artillery Institution. p. 42. The Chinese were certainly acquainted with saltpetre, the essential ingredient of gunpowder. They called it Chinese Snow and employed it early in the Christian era in the manufacture of fireworks and rockets. ^ Oliver Frederick Gillilan Hogg (1993). Clubs to cannon: warfare and weapons before the introduction of gunpowder (reprint ed.). Barnes & Noble Books. p. 216. ISBN 978-1-56619-364-1. Retrieved 2011-11-28. The Chinese were certainly acquainted with saltpetre, the essential ingredient of gunpowder. They called it Chinese snow and used it early in the Christian era in the manufacture of fireworks and rockets. ^ Partington, J.R. (1960). A History of Greek Fire and Gunpowder (illustrated, reprint ed.). JHU Press. p. 335. ISBN 978-0-8018-5954-0. Retrieved 2014-11-21. ^ Needham, Joseph; Yu, Ping-Yu (1980). Needham, Joseph, ed. Science and Civilisation in China: Volume 5, Chemistry and Chemical Technology, Part 4, Spagyrical Discovery and Invention: Apparatus, Theories and Gifts. Volume 5. Contributors Joseph Needham, Lu Gwei-Djen, Nathan Sivin (illustrated, reprint ed.). Cambridge University Press. p. 194. ISBN 978-0-521-08573-1. Retrieved 2014-11-21. ^ al-Hassan, Ahmad Y. "Potassium Nitrate in Arabic and Latin Sources". History of Science and Technology in Islam. Archived from the original on 2008-02-26. Retrieved 2007-07-24. ^ Needham, Volume 5, Part 1, 201. ^ Benjamin Elman, John Duncan and Herman Ooms ed. Rethinking Confucianism: Past and Present in China, Japan, Korea, and Vietnam (Los Angeles: UCLA Asian Pacific Monograph Series, 2002). ^ Yu Yingshi, Xiandai Ruxue Lun (River Edge: Global Publishing Co. Inc. 1996). Schottenhammer, Angela, ed. (2008). The East Asian Mediterranean: Maritime Crossroads of Culture, Commerce and Human Migration. Volume 6 of East Asian economic and socio-cultural studies: East Asian maritime history (illustrated ed.). Otto Harrassowitz Verlag. Zurndorfer, Harriet. "Oceans of history, seas of change: recent revisionist writing in western languages about China and East Asian maritime history during the period 1500–1630." International Journal of Asian Studies 13.1 (2016): 61–94.